whoa there, you didn't really think I was going to post my address for all the wide wide world of web to see did'ja? Nosiree. Send me an email saying that you want to play MailCon and I'll email you the address. 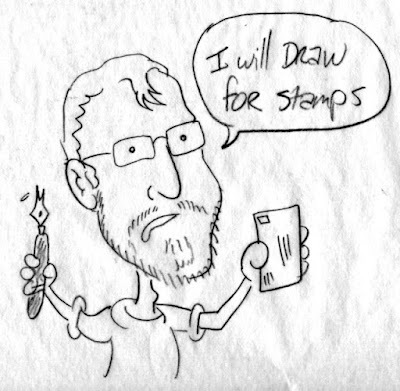 Then, you mail me a self addressed stamped envelope and I'll send it back with a sketch in it. The sketches will be drawn on typing paper or whatever else is lying around. If you want it on a special fancy paper then you need to send me the fancy special paper. If you want me to draw something specific, you'd better write it down on a note and put said note in the envelope. Remember, no mind powers. Also, be aware that the sketches will be folded to fit whatever kind of envelope you send but hey, it's free, who cares about folds or wrinkles? Another fun part of this gimmick, err, I mean genius world changing experiment, is that I'll scan the sketches and post them here in bloggy town. The whole thing will become some sort of intronet phenomenon and you will be right there at the heart of it. So, what are you waiting for? Start licking those stamps and envelopes now! p.s. Notice that at no point have I promised that any of these sketches would be good or interesting or actually look anything like what you are requesting. If you really want a good sketch, it's a good idea to put some money in the envelope. This is a good idea. I'm already wondering who we be first? A very good idea. Although do you have any idea how hopelessly confused the concept of the SASE leaves the people at the post office? I've left postal workers in tears from trying to explain the idea. Of course it is Snellville, so what do you expect? I remember your SASE story. Yeah, it's huge challenge to get a SASE delivered. What with the licking and folding... but there is a free sketch at the end of that rainbow.